Opponents of Neo-Darwinian evolution have argued that it is impossible, because many biological systems require an irreducible number of parts for the system to have any useful function. The concept of irreducibility requires a set of characteristics that must exist simultaneously. Such characteristics are termed critical characteristics. The advantage of identifying critical characteristics is that they give an indication of the minimum quantity of design information that must exist simultaneously in the genetic code for a mechanism to have any useful function. The irreducible mechanism of the knee joint is shown to contain at least 16 critical characteristics, each requiring thousands of precise units of information to exist simultaneously in the genetic code. This demonstrates that the knee could not have evolved but must have been created as a fully functioning limb joint from the beginning of its existence. It is important to note the confession that biologists do not make enough noise about the constraints of evolution because there is an obvious contradiction between the enormous restrictions of evolution and the obvious superiority of design in the natural world! In this paper, the concept of irreducibility is developed further to the level of an irreducible set of characteristics that must exist simultaneously for a mechanism to have any useful function. Such characteristics are termed critical characteristics. Critical characteristics must not only be simultaneously present, but they must also be simultaneously and precisely compatible with each other in order to produce the required physical effects. In general, the critical characteristics of mechanical mechanisms are often geometrical characteristics, because these must have precise values whereas other characteristics such as material properties do not usually have to have precise values. The advantage of identifying an irreducible set of critical characteristics is that they give an indication of the minimum quantity of information in the genetic code that must exist simultaneously and correctly. The identification of a set of critical characteristics provides overwhelming evidence that a natural mechanism could not have evolved. Figure 1. Anatomy of the knee joint (peripheral ligaments and knee cap removed). F = Femur, T = Tibia, LC = Lateral condyle, MC = Medial condyle, PCL = Posterior cruciate ligament, ACL = Anterior cruciate ligament. There are basically three types of limb joint in animals and humans. These are the ball and socket joint (e.g. hip and shoulder), the pivot joint (e.g. elbow) and the condylar joint (e.g. knee). The knee joint is the largest and most complex joint in the human body. The knee is called a condylar joint because of the articulation between the femur and the tibia, as shown in Figures 1 and 2.10 The femur has two protrusions called condyles. These have a convex curvature in order to roll and slide against the tibia. The tibia has two concave grooves that match the condyles of the femur. The two central ligaments that connect the tibia to the femur are called cruciate ligaments because of the way they form a cross. These cruciate ligaments fit neatly inside the space between the two condyles. The knee joint is an irreducible joint because each of its four complex parts needs to exist simultaneously and in a complex assembly to be able to perform its basic function. The two bones are essential because they perform the rolling and sliding motion. The two cruciate ligaments are essential because they act as mechanical linkages and perform a vital guiding function in the joint, as shown in Figure 2. If just one ligament is removed, then the joint cannot function as a hinge, and the joint can have no useful function. Figure 2. The irreducible mechanism of the knee (bones cut away to show cruciate ligaments). 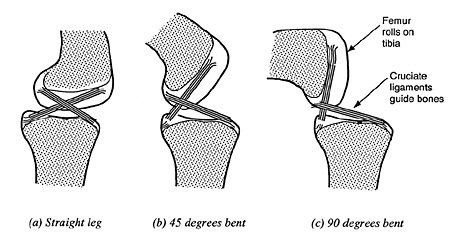 The four-bar hinge mechanism of the knee is shown at various stages of rotation in Figure 2. These stages of rotation are schematically presented in Figure 3 to show clearly how the four-bar hinge works. The cruciate ligaments form the two crossed bars (b & c) whilst the upper and lower bones effectively form the other two bars (a & d). The cruciate ligaments are able to pivot where they are attached to the bones (points 1, 2, 3 & 4) because they are made of a non-rigid material. In a four-bar hinge, the length of each of the four bars remains constant, but the angle between each bar can change so the lower leg can rotate. One important feature of the four-bar hinge is that the instantaneous centre of rotation approximately coincides with the cross-over point of the cruciate ligaments. This cross-over point moves as the joint opens and closes so that the knee does not have a fixed point of rotation, as does a simple pivot joint. The knee joint is a particularly sophisticated kind of four-bar hinge, because the cruciate ligaments are not rigid and have to be kept taut by the rolling action of the bones. Table 1: Critical characteristics in the knee joint. There are at least 16 critical characteristics in the knee joint as shown in Table 1. These are geometrical characteristics that are absolutely essential to the joint. For simplicity, these will be specified by the order of 16 genes in the genetic code. It could be argued that the knee joint also requires characteristics to trigger the growth of the four separate components. However, these have not been included in Table 1 because the evolutionist may argue that the four components already happened to exist in some ‘primitive joint’. It could also be argued that the knee joint requires characteristics to describe a muscle actuator. However, these too have been left out because the evolutionist may argue that these already happened to exist in some ‘primitive joint’. Therefore, these 16 characteristics represent a conservative estimate of the minimum required critical characteristics in the knee joint. If any one of the critical characteristics shown in Table 1 is missing, then the knee cannot function at all. Anyone who has experienced a ruptured cruciate ligament will know this only too well. The 16 critical characteristics must not only be present, but must also be precisely compatible with each other to produce the right physical motion. The two bones must have a compatible curvature at their interface and this curvature must also be precisely compatible with the position and movement of the cruciate ligaments. In particular, the bones must be shaped so as to make the lower leg rotate around the instantaneous centre of rotation of the four-bar hinge. If the attachment points are not in the right place on the bones, then the instantaneous centre of rotation of the knee joint will not be compatible with the shapes of the bones, and the knee will seize up or fall apart. The ligaments must also be assembled to the correct attachment points so that the ligaments form a cross as shown in Figures 2 and 3. If one of the ligaments was assembled to the wrong attachment point such that the cross was not formed, then the knee could not function as a hinge and would be useless. Figure 3. Schematic diagram of the four-bar mechanism in the knee joint. See text for explanation. Since a human characteristic is typically specified by one gene with about 1,000 chemical units of information, it requires many thousands of units of information in the genetic code to specify the essential design information of the four-bar hinge. The theory of evolution proposes that mutations cause random changes to units of information in the genetic code and that this leads to evolution. Yet with the knee, many thousands of precise units of information must be in place simultaneously for the knee to have any usefulness. Not only must all critical characteristics be present from the start but they must also remain unchanged, otherwise this will cause the physical system to break down. In the case of a healthy knee joint, if a random change is made to one of the critical characteristics, such as the position of a ligament, then the knee will cease to function properly because the position of the ligament is no longer compatible with other critical characteristics. This shows why random gene mutations generally cause malfunctions and suffering in living organisms. The knee joint presents a major challenge to the evolutionist because it is unique, and because there are no intermediate forms of joint between a condylar joint and the other two limb joints found in animals and humans—the ball and socket joint and the pivot joint. The knee is widely acknowledged by anatomists as being a completely distinct type of joint.12 This is because the knee uses completely different mechanical principles for hinged movement. Whereas the knee has two mechanical linkages that perform a vital guidance role (the cruciate ligaments), the joints of the hip, shoulder and elbow have no such mechanical linkages at all. Whereas the knee rolls and slides, the joints of the hip, shoulder and elbow only slide. Whereas the knee has a centre of rotation that moves by up to several centimetres, the joints of the hip, shoulder and elbow have a fixed centre of rotation. 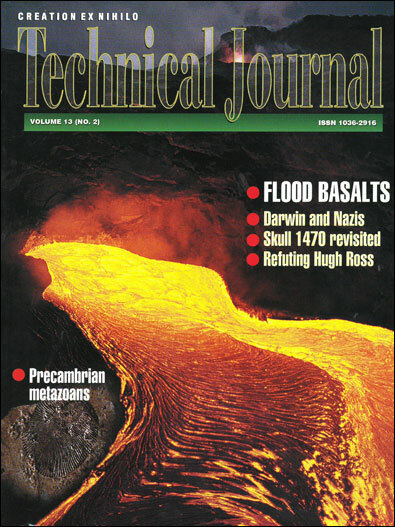 It is interesting to note that some biology books describe the knee joint as a ‘highly modified hinge joint’ implying that the knee must have evolved from the simple pivot joint that exists in the elbow.10 The use of the term ‘highly modified’ shows that evolutionists are aware that there is a big difference between a pivot joint and a condylar joint. In fact, the difference is enormous because there are no known intermediate mechanisms between a simple pivot hinge and a four-bar mechanism. Indeed, a pivot hinge has none of the critical characteristics shown in Table 1. In particular, a pivot joint has nothing remotely like the two crossed cruciate ligaments at the centre of the joint. 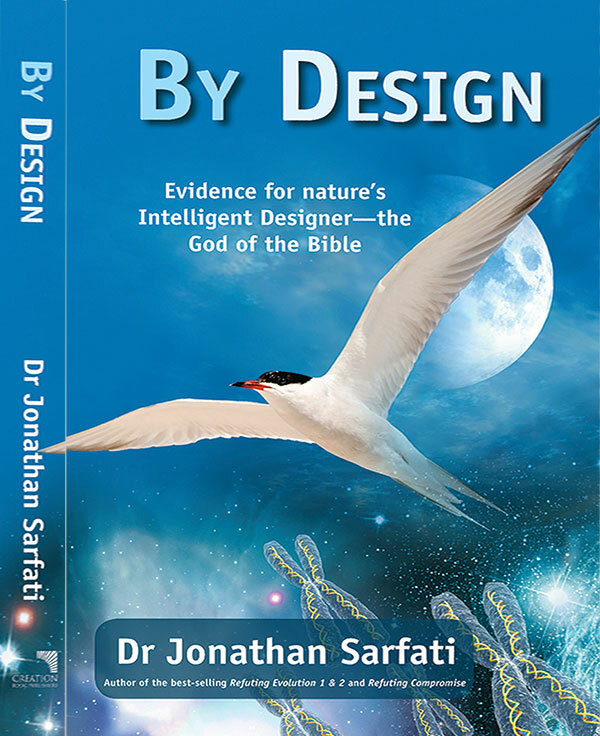 The evolutionist might argue that there is a similarity with the curved surfaces of the bones. However, there is even a distinct difference in the curvature of the bones between the knee and elbow joints because of the complex motion of the knee. It would seem impossible for evolutionism to explain how an evolutionary process could cause two ligaments to suddenly become crossed at the centre of a pivot joint, precisely at the same time that a space is formed to accommodate them, and precisely at the same time that a complex and compatible rolling motion is formed! The popular evolutionist Dawkins claims that he is not aware of any type of complex organ that could not have evolved by ‘numerous successive slight modifications’.13 However, the knee joint appears to be one clear example of a mechanism within the human body that could not possibly have evolved by numerous successive slight modifications. The anatomy of the knee in Figure 3 is deliberately simplified in order to identify the parts that are absolutely essential to the most basic function of the knee. Having demonstrated that there is an irreducible mechanism within the knee that cannot evolve, it is important to note that the complete knee contains an extremely efficient and elegant design with many complex parts. These include a bone at the front of the knee called the patella (knee-cap) and a fibrous capsule containing several ligaments, which encloses and supports the joint. There is also a soft cartilage to reduce shock loads between the bones and an elaborate arrangement of muscle fibres connected to the front and back of the leg to enable the movement of the joint to be finely controlled. There is even a lubricating fluid, called synovial fluid, inside the knee that makes the joint rotate smoothly and last a long time. 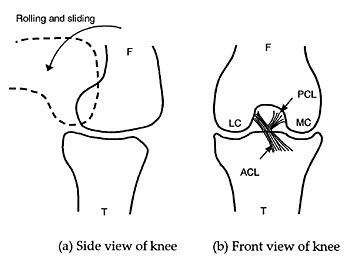 The biomechanics of the knee are also simplified in Figure 3 for clarity. In reality, the ligaments do stretch by a tiny amount when the knee is in certain positions. There is also a small amount of torsional freedom between the femur and tibia. These features make the knee joint an extremely sophisticated mechanism. Indeed, the knee joint is so sophisticated that human designers have been unable to produce an artificial knee that has anything approaching the performance of a real knee. Even though the fine details of the knee joint give wonderful evidence of design, it is only the irreducibility of the knee mechanism that can ‘prove’ the theory of evolution to be impossible. Evolutionists such as Richard Dawkins are experts at focusing attention on non-critical parts. If evolutionists attempted to discuss the evolution of the knee, I suspect they would describe in detail how the knee-cap was not actually essential and how it just appeared and was retained because it gave advantages. It is most likely that they would also say that the lubricating fluid was not essential but that it suddenly appeared and remained because it gave advantages. After giving many such examples, they may lead the reader into thinking that every single part of the knee could just evolve by chance. It is therefore very important to present to evolutionists the irreducible mechanism at the core of the knee joint and to identify critical characteristics. Non-critical characteristics are characteristics that do not have to be simultaneously present with exact values for a system to perform a useful function. Examples of non-critical characteristics in the knee joint include the colours and material properties of the cruciate ligaments and bones. Since these characteristics do not interact precisely with other characteristics and they do not affect the basic functioning of the knee, it is theoretically possible for these non-critical characteristics to evolve by mutation and in isolation. However, even though the ligaments and bones could in theory change in terms of colour and material properties by random mutations, these changes would not convert the knee into another kind of mechanism! The fact that evolution can in theory evolve characteristics that are non-critical is used by the evolutionist to give the impression that evolution can work. School textbooks often give examples of how a new colour of a creature such as a moth could evolve by mutation, and then say that with many mutations the moth could have evolved from a primitive creature. However, even though the colour of a moth may be important to its survival, the characteristic of colour is nevertheless a trivial one in terms of how it affects the functioning of organs and parts within the moth. Therefore, the example of the evolution of colour by mutation is not an example of evolution at all because no matter how many non-critical characteristics are evolved, they can never change one kind of functioning system into another kind of functioning system. When discussing evolution, biology books will rarely distinguish between critical and non-critical characteristics in an organism although characteristics are known to vary greatly in importance. This is very surprising, because a characteristic like the attachment position of a ligament is vastly more important than the colour of the ligament. There is no doubt that critical characteristics are obscured because evolutionists can only attempt to give trivial examples of evolution such as changes in colour. To demonstrate the theory of evolution, the evolutionist would have to show how a critical characteristic like the attachment position of the cruciate ligaments could evolve. However, this has never been done and can never be done because such a critical characteristic could not evolve in isolation. Four-bar hinges are commonly found in vehicle steering mechanisms. Engineers always start the design exercise with a complete set of parts. Following on from the transport analogy of Steven Vogel, the theory of evolution is analogous to proposing that one can take the engineering drawings of a simple pivot joint used in a motorbike steering wheel and evolve them into the drawings of the steering system of a four-wheeled vehicle. The information on the drawings is equivalent to the genetic code, and random photocopying errors in the information are analogous to mutations. The evolutionist believes that the random photocopying errors will sometimes produce a slightly better system, and that via selection, eventually the steering system of the motorbike will turn into a four-bar hinge and form the steering system of a four-wheeled vehicle! Such reasoning is absurd for several reasons. Firstly, if a random change were made to the information on a drawing of a motorbike steering system, then this would at best cause no change in the basic functions and at worst have catastrophic consequences. Secondly, there are no intermediate mechanisms between a motorbike steering system and a car steering system, whereas evolution would require hundreds of fully functioning intermediate forms. In a similar way, it is impossible for the knee joint to have evolved from a simple pivot joint such as the elbow joint. The basic principle of the knee joint is unique whether it is the knee joint of an animal or human being. However, there is yet a further problem for the evolutionist in that the human knee is distinctly different from animal knees. In the case of humans, the knee is designed to lock easily in extension (straight leg) so that maintaining straight legs and a vertical posture is easy. This design feature is one reason why man is a biped (two-legged) and is able to walk and run upright in a completely natural way. Apes’ knees cannot lock and must be continually loaded in flexion (bent leg). Thus apes are generally quadrupedal (four-legged) and it is extremely difficult for apes to maintain a vertical posture with its legs. Evolutionists admit that the only way apes can attempt to stand upright is by having awkward bends at the ankle, knee and hip joints.14 Such a distorted posture means that apes can only stay vertical for short periods and distances. In contrast, an able-bodied and fit human being can run many miles without great difficulty! That there are thousands of different types of animals on the earth that move with a horizontal stature provides great evidence that humans have been deliberately designed to be unique. ‘As you do not know what is the way of the wind, or how the bones grow in the womb of her who is with child, so you do not know the works of God who makes everything’ (Ecclesiastes 11:5). Whether gene mutations are random (as atheists believe) or planned (as many theistic evolutionists believe) the process of evolution cannot produce an irreducible mechanism because evolution is restricted to incremental change in the genetic code. The human knee joint is an irreducible mechanism that must have at least four complex parts existing simultaneously and in a complex assembly to perform any useful function. The 16 critical characteristics in the knee joint correspond to several thousand units of information in the genetic code. These units of information cannot evolve incrementally but must exist simultaneously for the knee to perform its basic function. There are no intermediate forms of joint between the condylar joint of the knee and the other two joints found in animals and humans—the ball and socket joint and the pivot joint. And there are distinct differences between the knee joint of animals and that of humans. There is thus overwhelming evidence that the knee was created as a fully functioning limb joint from the beginning of its existence. Roberts, M.B.V., Biology a Functional Approach, 4th Ed., Nelson, Walton-on-Thames, Surrey, p. 593, 1986. Return to text. Spetner, L, Not by Chance, The Judaica Press, Brooklyn, New York, 1997. Return to text. Behe, M.J., Darwin’s Black Box, Free Press, New York, p. 39, 1996. Return to text. For example, see Gish, D.T., Evolution: The Fossils Still Say NO! Creation-Life Publishers, El Cajon, California, p. 88, 1972. Return to text. Darwin, C., (1872), Origin of Species, 6th Ed., New York University Press, New York, p. 154, 1988. Return to text. Dawkins, R., The Blind Watchmaker, Penguin, London, p. 49, 1986. Return to text. Vogel, S., Cats’ Paws and Catapults, Penguin, London, p. 23, 1998. Return to text. Burgess, S.C., Hallmarks of Design, Day One Publications, to be published January 2000. This book examines several irreducible mechanisms in nature and also examines several other ‘hallmarks of design’. Return to text. Dawkins, R., Ref. 6, pp. 80–81. Return to text. Segal, P. and Jacob, M., The Knee, Wolfe, London, p. 9, 1983. Return to text. O’Connor, J. and Goodfellow, J., The mechanics of the knee and prosthesis design, Journal of Bone and Joint Surgery 60B:358–369, 1978. Return to text. Guyot, J., Atlas of Human Limb Joints, Springer-Verlag, New York, p. 20, 1981. Return to text. Dawkins, Ref. 6, p. 91. Return to text. Hinchliffe, J.R. and Johnson, D.R., The Development of the Vertebrate Limb, Clarendon Press, Oxford, pp. 37–39, 1980. Return to text. Scott, F. and Dye, M.D., An evolutionary perspective of the knee, Journal of Bone and Joint Surgery 69A:976–983, 1987. Return to text.